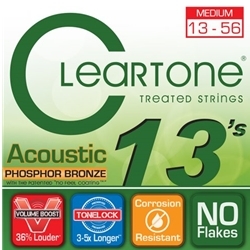 Cleartone Medium Acoustic Guitar Strings feature the finest phosphor bronze available for the warmest and brightest resonance on acoustic guitars. A unique treatment called EMP coats the entire string with an ultrathin protective film. It's the thinnest coating ever applied to guitar strings (less than one micron!) and will withstand more abuse from hard strumming than coatings 1000 times thicker! EMP ensures longer string life by protecting strings from corrosion due to skin acidity, salt, and moisture without compromising feel and sound.